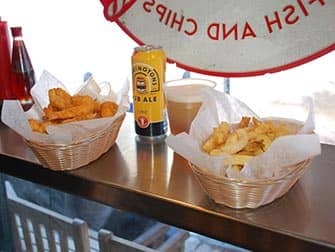 The best fish and chips in New York, hard to find? Nope! If you want to eat as the New Yorkers do though, I recommend sticking to pizzas and burgers. 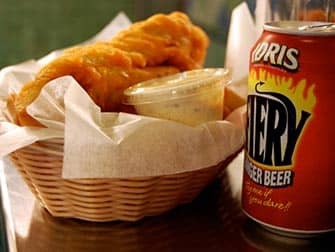 But, if you’re homesick or want to add some good ol’ English flavour to your New York experience, head to one of the places I’ve listed below, for some good battered fish and deep-fried chips. A Salt & Battery is my favourite fish and chips shop in Greenwich Village. It’s a friendly and authentic place, where staff have a British sense of humour. On the menu they have a selection of fish including cod, sole and haddock. Think crispy crusts and proper chips (no French fries here), as well as some homemade mushy peas, pickled onions, curry and homemade tartar sauce. The food is tasty and comes in large portions, making it good value for money. If you’re feeling adventurous, they even have deep fried candy bars. Mind you: you might want to come back for more. Jones Wood Foundry is a friendly, low-key pub focused on serving pub food, is tucked away on 76th Street, between First and York. It’s a little neighbourhood pub and it’s easily missed due to its off-the-avenue location. Upon entering, you walk through the narrow bar area to get to the dining room. They offer lunch, brunch and even afternoon tea as well as dinner of course. They serve a fine portion of cod where the batter is thick with plenty of crunch and triple-cooked (!) chips. A portion of beer battered cod and chips comes with tartar sauce and fresh lemon. If you want to visit during the weekend, note that Saturday nights can be busy. Molly’s is an authentic Irish pub in Gramercy, with a comfortable and homely atmosphere. This is also due to the sawdust on the floor and the real wood burning fire place. They happily pour pints of Guinness in this place and they serve a respectable platter of fresh cod and chips. Actually all portions are generally pretty big at this place. You can share your dinner plate, there is a sharing charge. The Churchill is a friendly and laid-back English tavern close to Park Avenue, it’s a little piece of home abroad. The restaurant is in old British/English style and has a good ambience. It might not exactly be a truly authentic British pub, but the intimate decor definitely adds to the overall experience. If you fancy a good start to your day: they offer a full English breakfast too. If you’re going for the fish, it’s fresh and meaty and comes with mushy peas. You can take your serving of fish and chips together with a good old pint of Guinness. They have a good selection of draft beer with plenty of ales from England. You can go for a private booth, but it’s a great place for large groups as well. Note that it can get pretty busy after work hours with office goers. Go to the second floor if it gets too loud on the first, they also have a bar up there. Prices are reasonable. Peculiarity: make sure to go to the bathroom. You’re in for a surprise, because Winston Churchill will talk to you. You can actually hear Churchill’s reading his speeches.